There is to be a referendum in Thailand on 19th August, in which the public will have the opportunity to vote for or against a new constitution. The proposed constitution has been drafted by committees appointed by the Council for National Security, after they abrogated the previous 1997 constitution. A 'yes' majority would lead to the adoption of the new constitution, though what would happen in the eventuality of a 'no' vote has not been made clear. There have been hints that, if the new constitution were rejected, the 1997 version would be reinstated, but Sonthi Boonyaratglin refuses to confirm exactly which previous constitution would be resurrected if the new one were rejected. 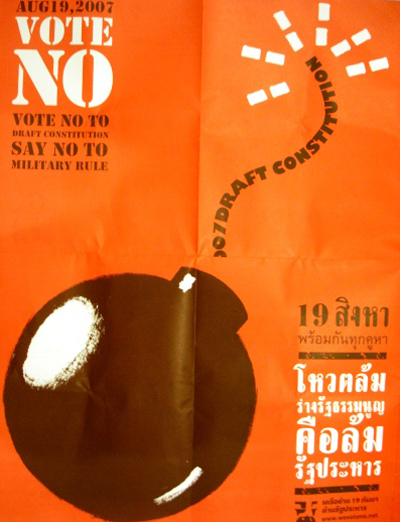 A 'yes' vote is also being promoted by the Constitution Drafting Assembly as a vote for a quick election. However, Sonthi promised to hold elections this year anyway, regardless of the referendum result. While the CDA is distributing propaganda, "VOTE NO" campaign posters (with illustrations by Pracha Suveeranont) have been seized and taxi drivers are being fined 1,000 baht for displaying anti-constitution stickers. The proposed new constitution includes an amnesty for the coup leaders. This alone is reason enough to reject it.